This is a “pepper and vegetable mixx” recipe that has been in the Formella family for over 100 years. It’s great on sandwiches, pizzas, pastas, in soups, sauces, salads, chili, and more. 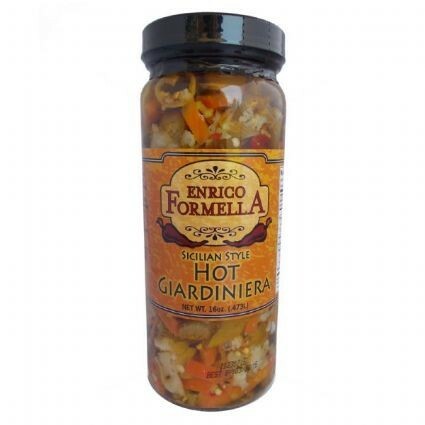 Giardiniera also adds an exciting new dimension to re-heated leftovers. This is a “pepper and vegetable mix” recipe that has been in the Formella family for over 100 years. It’s great on sandwiches, pizzas, pastas, in soups, sauces, salads, chili, and more. Giardiniera also adds an exciting new dimension to re-heated leftovers. 8oz. Mild Giardiniera	 each 8 oz. 16oz. Mild Giardiniera	 each 16 oz.